Emily's character and relationship to the other characters is so intriguing and the story so enthralling that at the end of the book I wanted to stand up and cheer it was so good. What made the experience of listening to Guilt the most enjoyable? John Rubinstein's infectious reading of the words of Johnathan Kellerman. 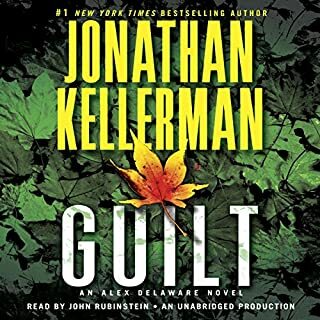 What was one of the most memorable moments of Guilt? One of the most memorable moments is when the character who was suspected of being the murderer turns out to be a herione. He gives different voices to each character and maintains that thoughtout the novel which makes the characters seem more real. I did not have an extreme reaction. There were moments of levity and moments of real joy when it turns out that the mother of the children and the children are guilt free. The City of Angels has more than its share of psychopaths, and no one recognizes that more acutely than the brilliant psychologist and police consultant Dr. Alex Delaware. Despite that, Constance Sykes, a sophisticated, successful physician, hardly seems like someone Alex needs to fear. Then, at the behest of the court, he becomes embroiled in a bizarre child custody dispute initiated by Connie against her sister and begins to realize that there is much about the siblings he has failed to comprehend. 'Killer' has a remarkable surprise ending. John Rubinstein reads Johnathan Kellerman's wonderful novel so that you just can't put it away. All of Kellerman's books are great. Guilt. Both Killer and Guilt have surprising turnaround endings. His inflections and feeling with different voices for different characters bring each of the characters to life. The rescue in the end of the mother and child when Ree asked Alex to just hold her after her rescue from her horrible ordeal. Would you listen to The Darkest Evening of the Year again? Why? Yes. It was never-ending intrigue and suspense and love for the characters. I didn't want to stop listening so that I could see that they made it ok. I would wait awhile to read it again, though, because it was intense. Dean Koontz is materful in ending a chapter with a 'tease' so that you cannot wait for the next; then, the next chapter may be another set of characters and events in the story wiht another 'tease' or 'worry' at the endof the chapter. I couldn't wait until the next entry with each character or set of characters. What does Kirsten Kairos bring to the story that you wouldn’t experience if you just read the book? She gave a real voice to Amy which made her even more loveable and intriguing. She read the narrative of each set of characters and the dialogue with just the right emotion. I wasn't sure about a female reader as I'm accustomed to the male readers. Kirsten was terrific. Absolutely. 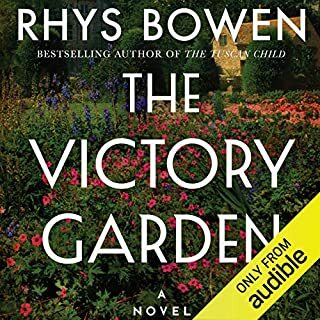 You better have all your work done and food ready to eat because this is one audiobook that you can't stop until youget to the remarkable ending..
All of us need a wonderful dog like NIckie. 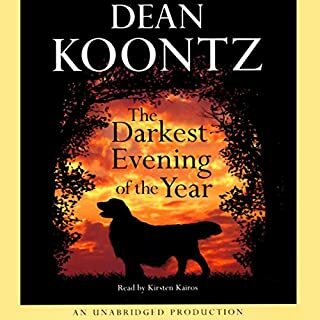 thank you, Dean Koontz, for another set of characters and dogs who steal our hearts. 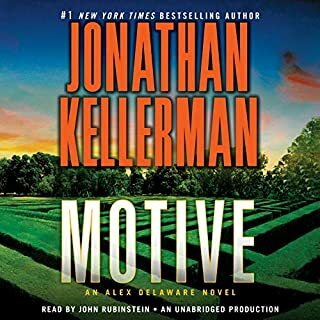 Where does Motive rank among all the audiobooks you’ve listened to so far? Alex, of course; but, Milo is a close second. This is a tie between Alex and Milo. I'm just glad there is a Johnathan Kellerman who writes such extraordinary novels. I would recommend this book to all of my friends. Thalia Mars grabs your attention from the start and holds your heart throughout the book. Twists and turns bring you to a satisfying conclusion. Thalia Mars because she remind me of an old and dear friend; however, my friend was not connected with the mob. Alex and Thalia in her bungalow talking. Who would murder a sweet little old lady? 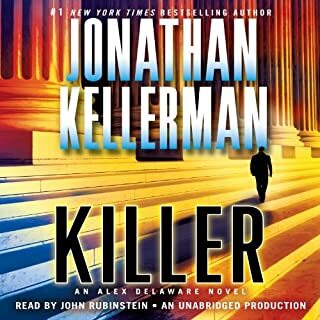 I thoroughly enjoyed this novel as I have always enjoyed Johnathan Kellerman's novels. Would you consider the audio edition of Breakdown to be better than the print version? Both the audio and written versions are great. John Rubinstein's reading of the book with his inflections for all the characters makes the audio version exciting. What other book might you compare Breakdown to and why? 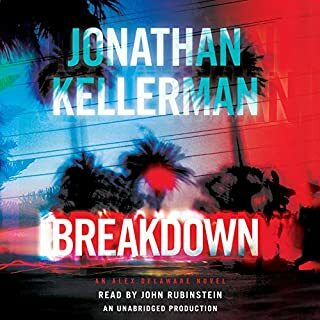 Breakdown can be compared to Johnathan Kellerman's other books as being another one of his masterpieces. a tangled flora of suspense--what has happened to Ovid? 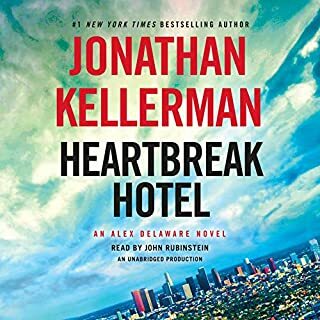 thank you, Johnathan Kellerman for another great novel.